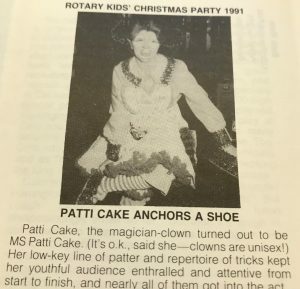 In the 1990s, in addition to holiday festivities for the grownups, Boulder Rotary also held Christmas parties for the children and grandchildren of club members. The RiB reported in 1991, “Despite the fact that Boulder schools were not yet out for the vacation, there was a surprisingly large number of little people present – really little people.” It was a scene of constant motion. 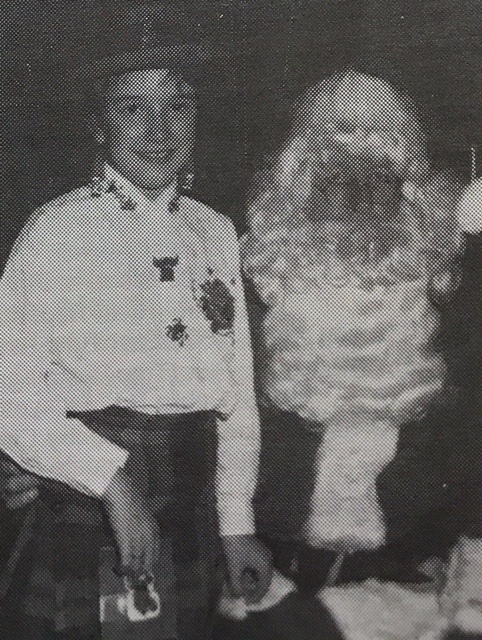 Fortunately, Santa soon appeared, a very skinny Santa! Thanks were given to Ray Hauser, who led the singing, and President Jon Kottke, who kept things moving along wherever needed. Did he ask Santa the first question, the RiB wondered? In 1994, George Russell, attired in a Dickensian costume complete with top hat, read a story about four elves: Elf Lonnie, Elf Jim, Elf Bill, and Elf Gary. All had been found guilty of pranks unseemly for Santa’s elf corps and had been sentenced to live in Boulder, a strange community, for a period of 1,000 years. They had spent their time building toys for children, continued George, and the children would vote on whether they liked the toys or not. If not, the elves would have to remain in their Boulder exile. After Santa had emptied his bag of toys and gifts, the ballots were tallied. Alas, there was one unfavorable vote. The elves would have to stay in Boulder. Some of them still may be here!